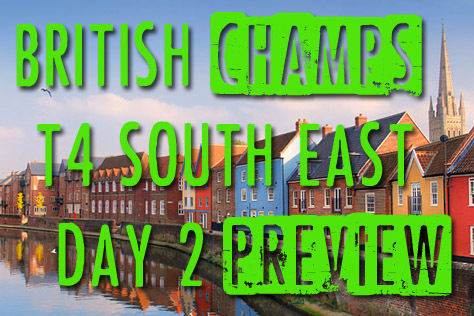 The first day of British Champs Tier 4 South East took place at the start of May in Stevenage. Those two games ended in what are known as “blowouts” with one of the sides in each amassing hundreds of points more than their opponents. 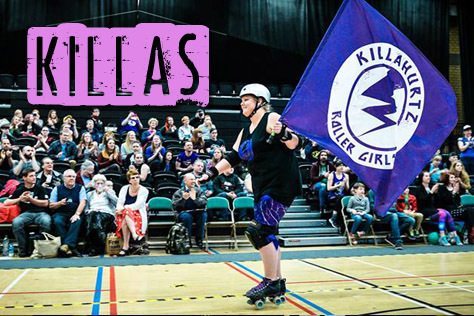 Killa Hurtz triumphed 342-43 over the Bombshells, while hosts Full Metal went down by an even bigger margin (396-15) at the hands of Suffolk Roller Derby. Naturally enough Suffolk (who sit out Day 2) top the division on points scored over Killa Hurtz, with the Bombshells and Full Metal occupying the bottom spots. Mid-table by dint of being the team that sat out day one are the Norfolk Brawds, who are hosting the second divisional game day this Saturday (6th June). The event is taking place at the University of East Anglia’s Sportspark on the Western edge of Norwich. Doors are at noon, with tickets available online at £7.50 each (including booking fee) from the link at the bottom of this piece. The afterparty takes place midway between the University and City Centre at the Eagle on Newmarket Road (the A11) in the Golden Triangle area, which is supposedly even more of a Green Party heartland than Brighton’s Hanover (more than two thirds of the vote in some wards). With the greatest of respect to some of the other towns represented in Champs, Norwich is one destination we would particularly recommend making a weekend of if you can. Not only is it one of the best real ale towns in the UK (around Dereham Road in particular), with a castle, cathedral and twice as many board game shops as the whole of Sussex – yeah we’re geeks – there’s also the messing about on boats to be had. Er, though you could end up trapped, like our boating mates who should be in the South of France now. Seems the lock that joins the Broads to the North Sea has been broken (non-navigable) for months. Cannes, Loddon, quelle difference? Flattrackstats calls the Bombshells v Herts Breakers game quite strongly in favour of Eastbourne. The Sussex league currently rank 306th in Europe on 450.0 points with the Full Metal women 357th on 373.0. While that doesn’t look a huge positional gap, splitting the difference between home and away predictions (since there’s no neutral option) calls this as 94% likely to be an Eastbourne win, with an anticipated 42:19 differential working out as something like a 252-114 Bombshells victory margin. What did you learn from your first Champs game against Killa Hurtz? We guess it wasn’t quite what you were expecting? I’d say that’s a mild understatement! Killa Hurtz had really solid walls and gave out some hard hits. We knew it would be tough but even some of our strongest players struggled. They managed to wear us down early on and break apart our walls. From a jamming perspective it was exhausting – by the time we’d got to the last blocker we were easily hit off. On a positive note, we did learn a few things that we will be putting into practice for our forthcoming games. In particular, responding to offence and working on our own offence. We need to work on keeping our walls tight and reforming faster. As a team we have really been working on our overall fitness and, although it was a crushing defeat, our stamina has improved. Getting more points in the second half shows we can dig deep when it matters! 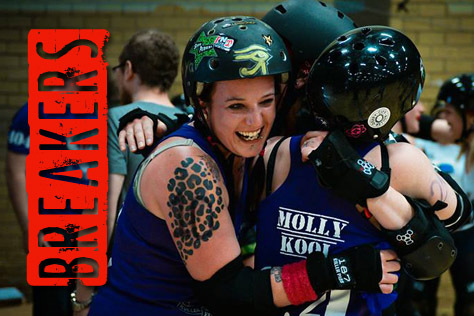 Your next opponents, Full Metal RD’s Herts Breakers, also had a heavy loss on that first game day. What do you know about them? We know Full Metal are new to bouting, so I’m sure they’ll want to do their best and make their mark. They will have learnt a lot from their game against Suffolk and I’m sure if there were any first game nerves to be had, they will have dissipated and they’ll be hungry for the next one. Herts will be used to hard hits and pushing against solid players as, like us, they are used to training co-ed. Any Eastbourne players or tactics people should look out for in the game? Are Flattrackstats right to predict a big Bombshells win? Amazing Graze has been doing some great jamming (I’m refraining from saying Amaaazing!). 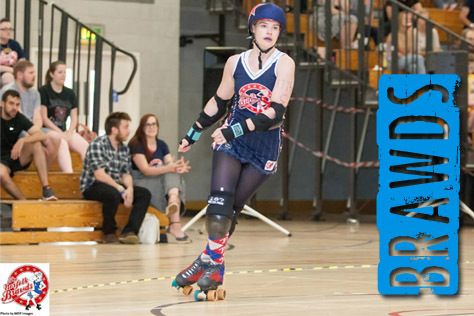 She’s been working hard at training and has been taking part in mixed scrims; most recently as part of Roll Britannia against the Brighton Rockerbillies, where she was awarded MVP. Jumpin’ Jack Smash has also gone from strength to strength and is knocking out some devastating hits. Naturally, we’ll be aiming to win because there is no other way, but we would never like to predict what can happen. We need to play our game, put in to practice the offence we’ve worked on, but not forget the basics. We’ll need to be focused as a team if we want to improve that points differential. Finally, the day’s other game sees hosts Norfolk Brawds take on Killa Hurtz. How do you expect that one to go, and are there any standout players on those teams to look out for? We came up against the Brawds in last year’s Heartland Series and their jammers aren’t afraid to go in hard. 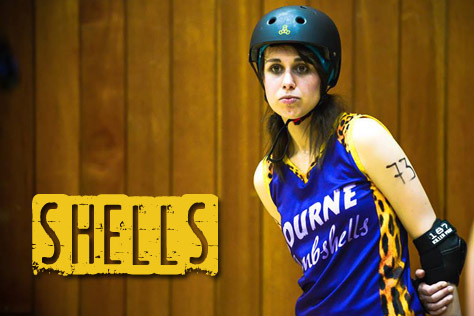 Philthy Delphia is a strong jammer who will test the Killa Hurtz walls. I’d expect a Killa Hurtz win, but for the Brawds to get a decent score against them. It’ll be an exciting one to watch. It may be Killa Hurtz’ toughest game of this Champs season. Mother Mercy, Clark Smash and Melef!cent are all going to give the Brawds jammers a hard time. The Beckoning just will not move out of the way! Was the result of your first British Champs game what you were hoping for? Is there anything you learned from that game that you’ll be taking forward to the rest of your Champs season? We were just hoping for double figures in all honesty. We knew we weren’t going to win, but we wanted to have some fun and host a successful first bout, and we are so proud of ourselves for that. Also eleven of us popped our bouting cherries that game and it was awesome to do it all together as a team. We have a bout’s experience under our belts now and a bit of a fire in our bellies. Gotta start somewhere. Your next opponents, Eastbourne Roller Derby’s Bourne Bombshells, also had a heavy loss on that first game day. What do you know about the Sussex side? We’ve seen that the Bombshells have heart, strength and determination, and we’re looking forward to our game with them. I’ve a feeling they’ll have a fire in them too. Any Herts Breakers players or tactics people should look out for in the game? Flattrackstats gives 90-95% chance of an Eastbourne win. What are you expecting? Results wise we are just hoping to improve on our points. We got 15 last time, this time we’ll go for 30 and so on. Winning really isn’t what it’s about for us; we’re just starting as a bouting team so the whole experience is amazing. As for players to look out for, all of us I guess. We’re learning and growing as a team with each bout and scrim. It’s exciting to watch us all develop as skaters together. Finally, the day’s other game sees hosts Norfolk Brawds take on Killa Hurtz. How do you expect that one to go? We are both excited and terrified to watch this game! Both teams are fantastic. I’ve personally seen more of the Killa Hurtz, so I know for certain the strength and skill they possess. I wouldn’t like to hazard a guess at the outcome, but it’s going to be a blinding bout that’s for sure. As for standout players, Mother Mercy from Killas has a pretty fearsome rep; she’s an awesome player and definitely one to watch out for (and avoid) on track. You’re the only side in Tier 4 South East that sat out Game Day 1. What do you know of the other four teams in the division? We actually had a “Brawds Day Out” to the first game day to check things out, but also to support all the teams. We’ve been watching Suffolk since they started and it was great to see how strong they’ve gotten. The first contact we really had with Killa Hurtz was at our Eastern Sur5al event last year and they sent a few girls again this year – so we were excited to see them skate as a team. Eastbourne were in our division of the Heartland Series last year but this was our first time (like many) seeing Full Metal on the track. Definitely a lot of new faces, but quite a few familiar ones too! You’ll be taking on Killa Hurtz in your first game. Any particular players or tactics of theirs you’ll be looking out for? Killa Hurtz definitely have some strong, experienced players on their side so we know it’s going to be a tough game, but they are also a lovely group of ladies so we’re sure it’s going to be a fun one too. Any Brawds players or tactics people should look out for in the game? Flattrackstats narrowly gives Killa Hurtz the edge in this match-up. What are you expecting? Well, we can’t give away too many of our secrets! We’re going to be relying on our experience skating together as a team. Most of our All Stars have been skating together for years. The day’s other game sees Eastbourne take on Full Metal’s Herts Breakers. How do you expect that game to go? This should actually be a really interesting match-up. We’ve played Bourne so we know they have a lot of fight in them and bout experience. Full Metal are a bit of a dark horse. Neither had a great first game day, but this could turn out to be a close, exciting bout. Finally, the Brawds are hosting the action on Saturday 6th. What can you tell us about your venue? What can people expect from the afterparty? We are *so* lucky to have one of the largest and most successful sports centres in the UK, the Sportspark at the University of East Anglia, as our home open venue. Technically we can seat more than 500 people in our bleacher seating and we usually have 300-400 spectators at our home events. The Sportspark offers free parking, a full bar which sells our own ale Bonny’s Gold (brewed by Golden Triangle Brewery), two different cafes, a large vendor area, free face painting, and an awesome raffle. We are also fundraising for our own venue and will be taking donations to ‘wax a Smackson (our affiliated men’s team)’ during half time. The afterparty will consist of a massive BBQ and drinks in the big beer garden at The Eagle Pub and possibly dancing at the Waterfront after! Killa Hurtz have rocketed up the European rankings, rising from 270th to 105th in less than a year of bouting, and took a big win over Eastbourne in your first Champs game. As the division’s highest ranked team who do you think will be your biggest challengers? We came into Champs not knowing what to expect, and with the ethos of taking every game as it comes and not taking anything for granted. We had no idea what to expect from Eastbourne. It was a good game and they did not make it an easy win for us. We would love to win the division. I would say in the short term our biggest challengers would be the Brawds. However, in October we face Suffolk. We have played them twice in the past year and it’s one apiece… Both of us are training new skaters at the moment, so it is highly likely by the time October rolls around both teams will be fielding players neither team has met before, which always makes for a challenge! You’re up against the Norfolk Brawds on Saturday. Any particular Brawds you’ll be looking out for? We are indeed. Norfolk have obviously been in Heartland Series before Champs and we’ve seen some of their games. With Damage having left, it will be interesting who will be in her spot on the roster. We shall be keeping an eye on Philthy and Short Circuit… We’ve also heard rumblings about Penny Slain as someone to watch out for. Any Killa Hurtz players or tactics that people in the crowd should look out for? We wouldn’t want to give away any of our secrets! Our lips are sealed. I think this is going to be a really good game to watch whatever the result. Finally, the day’s other game sees Eastbourne take on Full Metal RD. Any particular players the crowd should look out for there? Eastbourne are definitely the favourites. The Philosofear caused our jammers a lot of problems when we played them. Definitely the skater to contain!